After a few reschedules, it was finally a go. Ed the Tall and I were on tap for the first Ramble Ride and the weather was looking to be spectacular. The day was warm (almost too warm sometimes), the grass was green , and the breeze was mild. The Santa Ana winds that often blow into So Cal in the spring were not present. That was a good thing as we would have been doing a long climb right into the teeth of it if they were. The whole idea of a Ramble is to tie together sections of the countryside that, on their own, may not be worth a ride or they may end up in an awkward place for a nice loop, etc. If possible, the ride connects through sections of highway or streets, hopefully hits a convenience store so you can travel lighter, and ends up back at the start with no shuttle. This ride was the first one. It was odd, but I was not particularly prepared for the day. Odd because I am usually over prepared. It has been a trying week for my work schedule with quite a few very early morning hours and time spent sleeping at the office in between things, so that was not in my favor. I was also dehydrated, something that seems to hit me when the weather turns from winter to spring and the dry winds hit the coast. It has been in the 80s as far as temps and after riding with layers of clothing and such for months, it felt like riding under a heat lamp. The night before I had putted out on the SS Rockhopper to see how it felt and I was riding up a nearby canyon doubletrack when I realized I had no legs at all. Man, that was not good for the next day. But, whatya' gonna' do? That night I was feeling pretty bad with a serious headache and fatigue from being at work at 02:00 that morning. It was a full evening of social things with the family and by 09:30 I was toast and was not able to get my kit bag together for the next day's ride. Off to bed for me. The next morning I was a wandering generality, not a meaningful specific and I was running late. I meant to peel and bring an orange for snacking on...no time...I considered grabbing the 100oz hydration pack instead of the 70oz one I had packed, but...no time. Out the door with what was in the food drawer...some trail mix and a Payday or two. Yum...Paydays. I'm late. This is what happens when your Stan's Sealant dries out. Ed found out he had an airless tire. That left him with no spare tubes and I realized I had only one with me. Typically I would carry two on a remote ride like this. Another casualty of my lack of planning. We considered driving out to get tubes, but decided to cast fate to the wind and go on as we were. Pedaling up the first section of trail, a nice warm-up leading to a 30 minute climb, the flowers were beginning to wake up as poppies were rubbing the sleep out of their eyes. My legs felt pretty dead still, but Ed was letting me wake up too. "Hey Granny, sometime today, huh?" Topping out, we could see over the valley to the final summit. 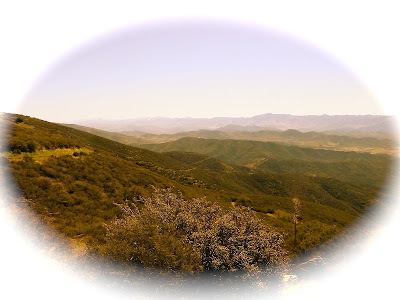 We would drop all the way down into the basin before we began a long climb up to Sierra Pelona Ridge. This basin area and the mountain surrounding it has lots of moto traffic, but on a Thursday, it was quiet and peaceful. The creek was running and the birds were doing what happy birds do. The climb was never terribly hard, but it was prolonged and in the full sun. I was very aware that I was not carrying enough water. 70oz of H2O and one bottle of Accelerade would have been enough in cooler weather as we had a resupply point built into the ride. But in 80+ degree weather, it was a bit lacking. And, I had left my box of Endurolytes in the truck. Great! At this point it became a bit of body rationing...not pushing too hard, not drinking too much. Ed had some extra Endurolyte caps and he was feeling pretty chipper, so he shared. Thanks. I needed that. We hit the top and looked down at the next leg of the ride, a multi mile singletrack descent back to civilization. The Epic Marathon was the steed of choice. I was on the Epic Marathon, a bike which has proved to be an excellent choice for long adventure rides. The only caveat is not having a deep, deep, low gear. But, it was enough for the day and then some. Truly a sweet mannered bike. The trail was in great shape, the top being littered with hens egg size broken rock and ledges, and the new tires I have been running...the Specialized 2.2 Purgatory Controls...were up to the task. They have been impressing me as an all-a-round tire and as things have dried out, they still are doing very well, especially in the rubbly stuff. The bottom section of trail was smooth and swoopy. Ed could barely contain himself and was inspired to do the 'Sound Of Music' thing, dancing across the fields of green, singing, etc. But, we were moving too fast for that kind of stuff to happen. Maybe next time. Two things had happened at the top of the second climb...I had slurped my last sip of water out of my Camelbak, and I had gotten my first leg cramp. It was all downhill to the country store...well, pretty much downhill...so I was not too worried. Still, I always live in fear of leg cramps, my nemesis, and here they were with a couple hours of riding to go. Along the way, we ran across this little fella' on the trailside. Ain't he a nifty little dinosaur, though? We hit the general store and tanked up on liquids. Ed was doing well. Eschewing any refreshment, he only took a damp napkin and brushed his lips with it. That was all he needed (pretty sure that was what happened...I may have been delirious). I drank a Gatorade and about a quart of water and hoped for the best. Ed the Tall, fresh as a Daisy. My hero. We rolled past some countryside planted with vineyards and had a casual spin down the highway leading up to the next climb to close out the loop. I was sitting there pedaling along, feeling pretty good and another leg cramp hit that nearly took me off the bike. I have ridden with cramping quads and calves for hours before, but I have to admit that the pain level of this was on another level altogether. I am talking childbirth here. From my inner, right knee to crotch, it was on fire. So I pedaled with my left leg and hung the right leg straight in the breeze. That worked. The final hill climb was non eventful except for walking the grade asked of me. Pride has no place on a Ramble Ride. Walking got it done and stretched things out a bit till I could pedal circles again. The last view before we dropped into the final stretch home, that being a fireroad to singletrack section. Hitting the end of the ride, Ed passed on getting a shuttle back home from me and pedaled on another 10 miles or so. The Ramble loop was around 37 miles and Ed added about 20 miles to that of pavement back and forth to the start/finish. Must be nice. I think he is ready for his race. The first Ramble Ride was a success despite the lack of ooomph on my part, and frankly, I have had worse (and paid money for it!). The next Ramble is in the works. One goes out...one comes in.